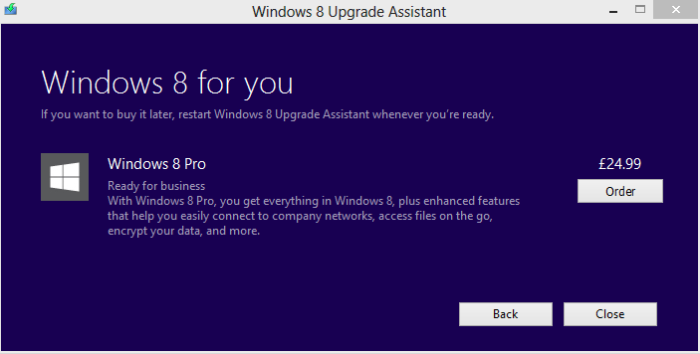 I’m a big fan of Windows 8 and I’ve been using it for around a year in it’s various guises (developer, release and RTM). 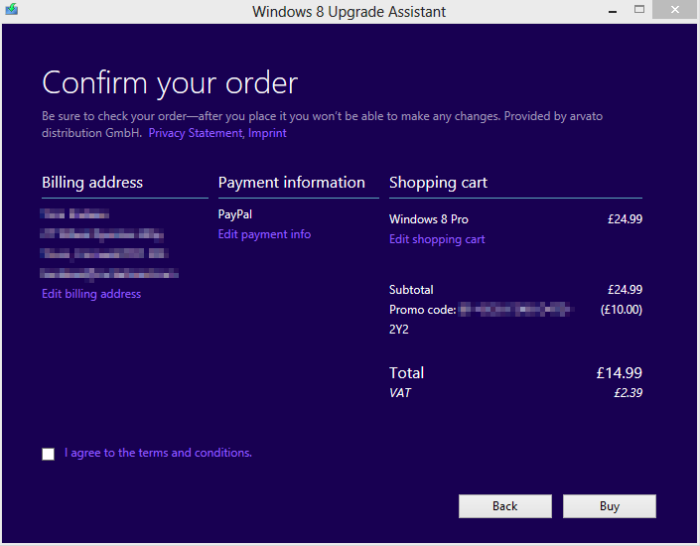 When it was confirmed they would be providing the upgrade for a measly £14.99 I decided to run through the process and see how easy Microsoft have made it for people to upgrade to the latest and greatest. I’ve detailed the experience below, it was very straight forward and quick to run through. 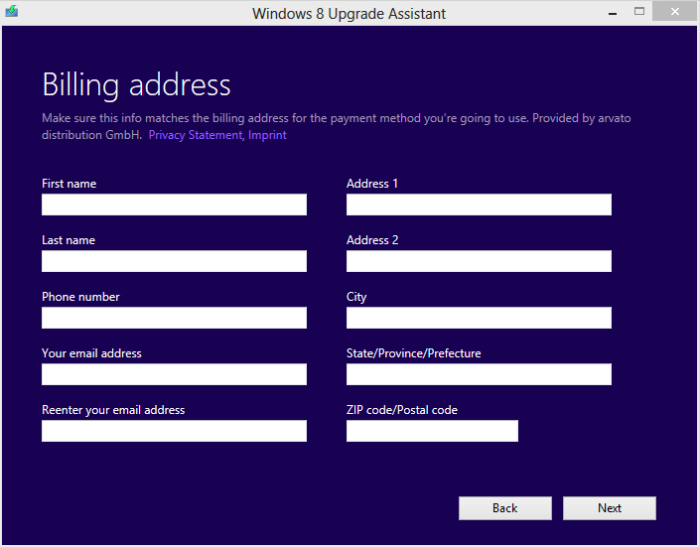 If you’re looking to upgrade and meet the requirements this is the way to do it. You’ll be asked to fill in some basic information. 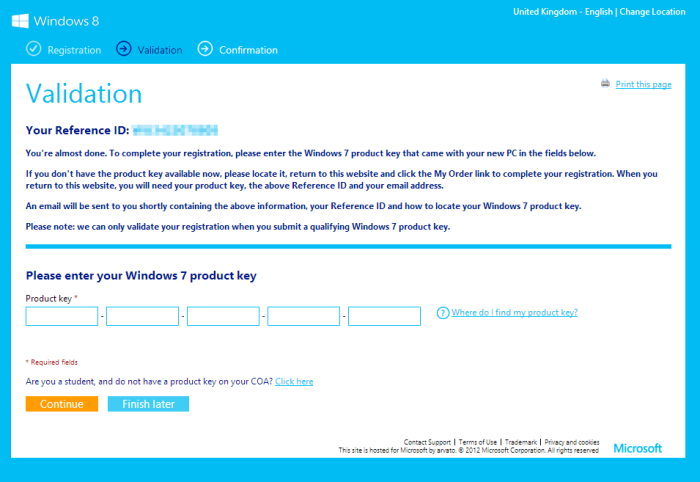 Here you will need to enter a valid Windows 7 product key. Success! 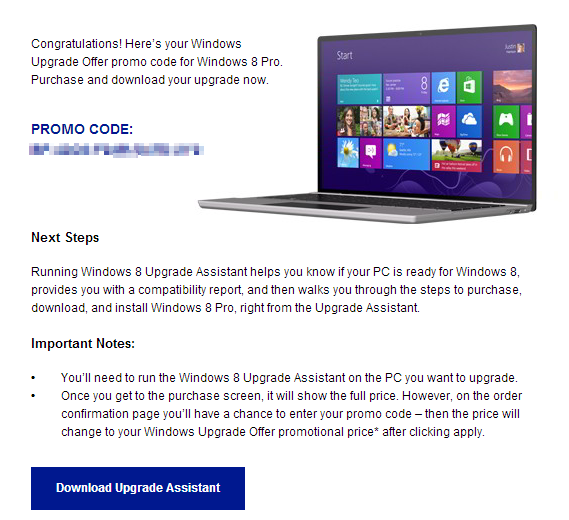 Microsoft will now email you a promotion code to the address registered with a link to the Download Upgrade Assistant. I didn’t really want to run this, but after a (quick) search around the site it seemed you have to. I was already running Windows 8 (the 90 day enterprise trial), so when proceeding it was giving me the error message: Sorry, Windows 8 isn’t available for online purchase in the country/region you’re in. 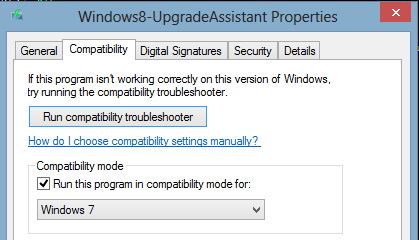 You can get around this by right clicking the Download Upgrade Assistant (Windows8-UpgradeAssistant.exe) going to the compatibility tab and setting the compatibility mode to Windows 7. 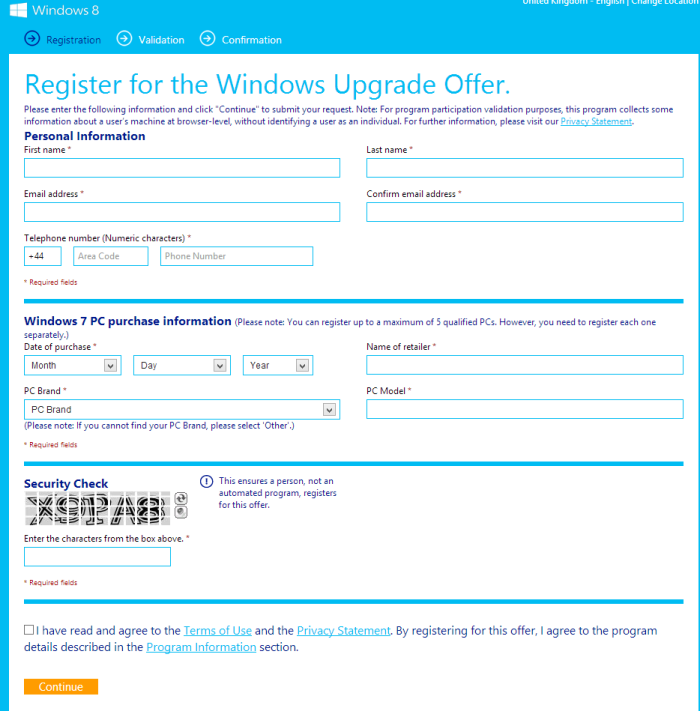 I’m told I can order Windows 8 Pro for Â£24.99. It then asks if you want to purchase physical media, I do not. Some basic information about billing. Payment information, at this point I’m thinking “So when is it going to ask me for the promo code”. I chose Paypal and pressed continue, and there was thankfully a box to put the promo code. For some reason I didn’t screenshot this, but trust me- it’s there! Click buy and you will be redirected, to in my case, Paypal. After you have paid you are thanked for your order and your product key is displayed (this is also emailed to the address you registered). Windows 8 starts to download, luckily I have an amazing 2Mbit connection so I only have to wait 3 hours or so. 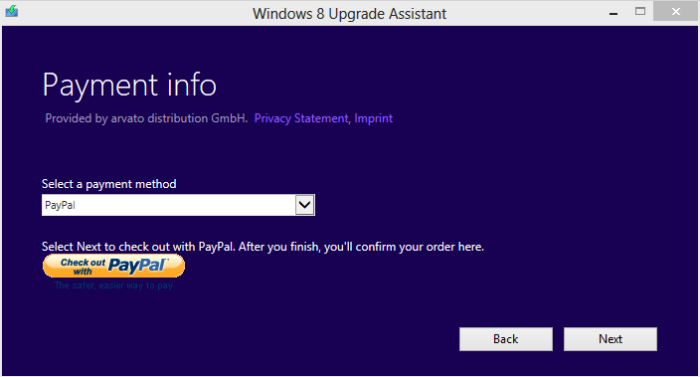 When the download is complete you will be asked when and how you want to install Windows8. You can create an ISO file or an USB flash drive installation, I chose ISO which dumps Windows.iso to a location of your choice ready for burning to DVD. Can you perform a clean install from the media? 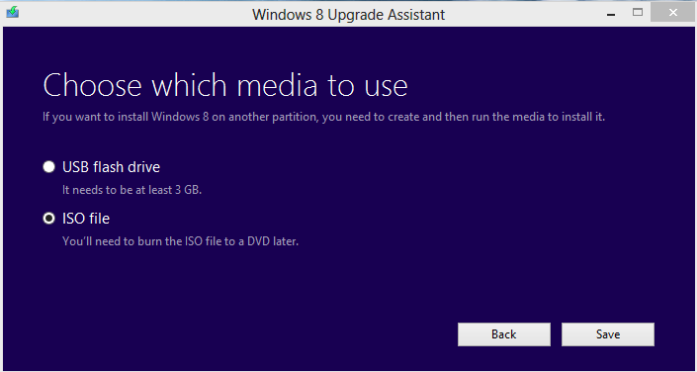 Yes, after burning the ISO to DVD or using the flash drive to boot from you can install Windows 8 Pro. You will be prompted for your product key which you received when going through the process above.